It's the PC Gamer Show! For this episode, Chris Thursten and Wes Fenlon traveled to the Smite World Championship in Atlanta, Georgia, an e-sports tournament with $2.3 million on the line. But we didn't just sit in the crowd—we went behind the scenes to see how Hi-Rez Studios puts on a gigantic tournament. Join us for a look at how an e-sports tournament is put together, from full-body cosplay painting to A/V production to livecasting. We also talk to Hi-Rez Studios about how they prepared for the event and how Smite has grown over the past year. 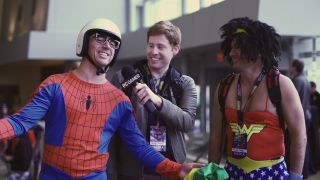 Special guest star Brazilian Spiderman makes his PC Gamer Show debut in this episode.